Political inclusion of all citizens regardless of gender, race, disability, ethnicity, or sexuality is a cornerstone of representative governance. The principle of one-person one-vote is fundamental to genuine democracy. While there has been some progress in increasing political access for persons with disabilities around the world, much less progress has been made to remove barriers to participation for people with intellectual and psychosocial disabilities*. In fact, they often face legal and structural restrictions to their participation – including the full denial of their fundamental right to vote – based solely on their disability or the fact that they are under guardianship. Over the last decade, international and regional bodies such as the United Nations, European Court of Human Rights and Council of Europe have taken positions supporting the political rights of all persons with disabilities, including individuals with intellectual and psychosocial disabilities. The UN Convention on the Rights of Persons with Disabilities (UN CRPD) upholds these equal political rights. These strides are important frameworks under which countries can be urged to further recognize universal suffrage, and remove legal and structural barriers to full participation. This community faces significant obstacles to full and equal participation in Ukraine as well, despite the fact that the UN CRPD was ratified in Ukraine in 2010. In Ukraine, under Article 70 of the Constitution, persons who have been deemed “incapable” by a court are not allowed to vote or run for office. People with intellectual and psychosocial disabilities also face societal discrimination, and often do not have access to accessible and easy-to-read information on the political and electoral process. “There are many reasons why people with intellectual and psychosocial disabilities are more likely to encounter barriers in exercising their political rights in Ukraine. Among them are imperfections of Ukrainian legislation, the lack of information in accessible formats, lack of awareness on these issues among the electoral stakeholders, and the stigma that still exists in our society”, says Nataliia Skrypka, the Executive Director of the National Assembly of People with Disabilities of Ukraine. 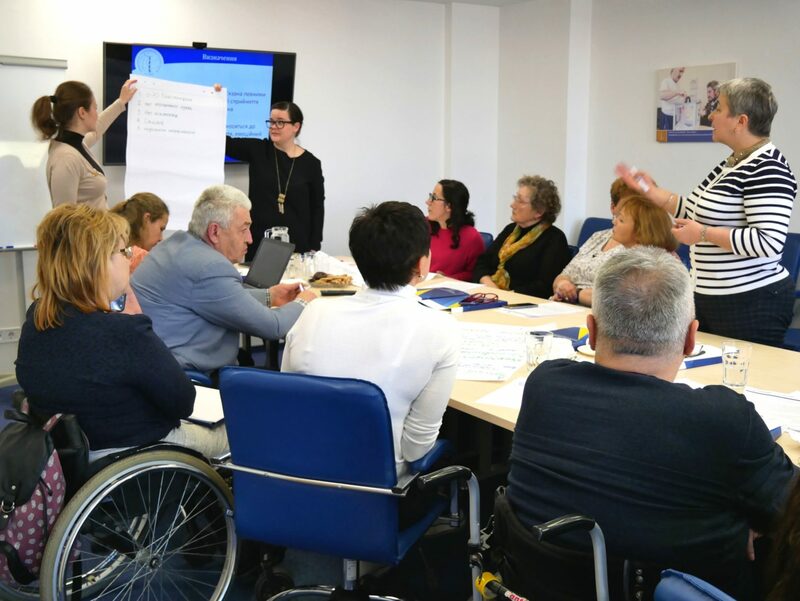 With support from the United States Agency for International Development (USAID), Global Affairs Canada, and UK aid, on April 4, 2019, IFES Ukraine with its partner organization, the National Assembly of Persons with Disabilities (NAPD), brought together representatives from the disability community from across Ukraine to discuss obstacles that persons with intellectual and psychosocial disabilities face in accessing their political and electoral rights in Ukraine, plan for advocacy efforts to counter discrimination, and draft solutions that will remedy issues such as discrimination and access to information. Participants highlighted the need for a clear legislative advocacy plan, increased training of election officials on inclusion and awareness, involving community members in addressing stigma, and developing easy-to-read formats for critical election information. Participants prepared themselves for advocacy using scenarios to counter exclusionary arguments, shared their experiences, and planned for future engagement, education and action. Participants shared information about regional and international best practice, and will plan to meet again after Ukraine’s presidential run-off on April 21st. The next meeting will focus on next steps, the intersectional nature of discrimination, IDPs with disabilities, and legal advocacy. “Till now, thousands of people in Ukraine do not have a right to vote in the elections. We believe that IFES’ activities in the sphere of inclusion promotion in Ukraine launched during the workshop are a starting point for enabling full participation of people with intellectual disabilities in the political life of the country”, concluded coordinator at the Ukrainian NGO “Fight for Right” Yuliia Sachuk after the training. * Intellectual disability is a term used when there are limits to a person’s ability to learn at an expected level and function in daily life. Psychosocial disability refers to conditions that affect cognition, emotion, and behavior.